God will always have the last say in any matter, for He in His power takes down the mighty and haughty and exalts the lowly and those of low estate. (Luke 1:50-55). And his mercy is on them that fear him from generation to generation. He hath shewed strength with his arm; he hath scattered the proud in the imagination of their hearts. 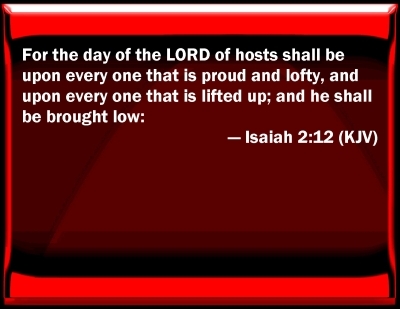 He hath put down the mighty from their seats, and exalted them of low degree. He hath filled the hungry with good things; and the rich he hath sent empty away. He hath helped his servant Israel, in remembrance of his mercy; As he spake to our fathers, to Abraham, and to his seed for ever. Daniel prayed three times a day which was against the kings way of doing things, and he never turned from God to serve other gods as he knew His God gave wisdom to the wise and could remove kings and set other ones up. (Daniel 2:20-22).